The Pacific Palisades just got a whole lot sweeter! Naturally, there has been tons of excitement about the recent opening of the gorgeous new Palisades Village, but one opening at the top of everyone’s must-visit list is the first ever bricks and mortar location of the cult Sweet Laurel Bakery. From incredible female founders, Laurel Gallucci and Claire Thomas, Sweet Laurel is the uber-popular whole foods baking company that has been continuously praised for their inventive and beautiful approach to grain-free, refined sugar-free, and dairy-free baked goods. Seriously, check out their Instagram - each creation is more beautiful than the next and almost too pretty to eat! (Almost). 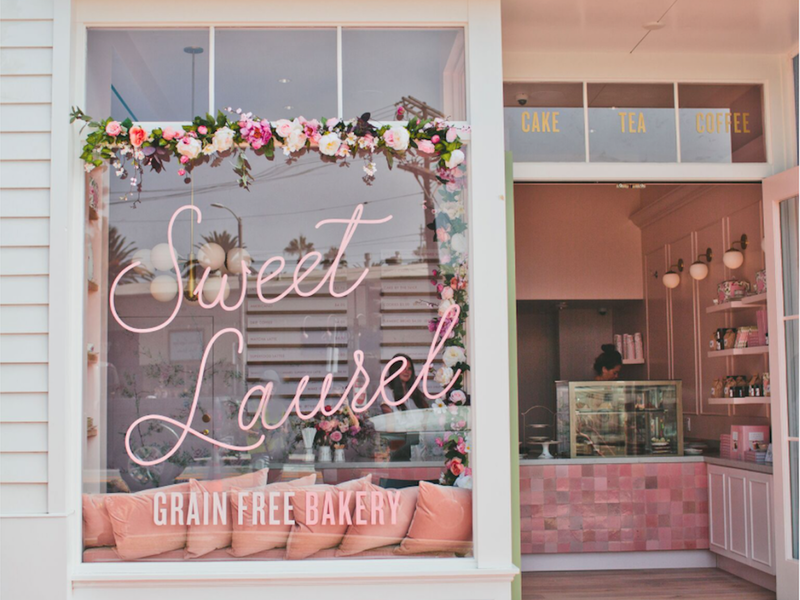 Their new home in the Palisades Village embodies Laurel and Claire’s approach to baking where you can have your cake and eat it too (guilt-free!) in a warm and inviting environment right in their neighborhood. “For us, this is a return home,” says Laurel and Claire. “We grew up locally in Santa Monica and were part of the Palisades community throughout our childhood.” Claire went to school in Pacific Palisades and Laurel ironically got a mint chocolate chip ice cream cake from the old ice cream shop on Swarthmore every year! At the stunning new location, you can expect all of the Sweet Laurel favorites along with some new treats! Sweet and savory cookies, cakes, mini loaves, and brownies exclusive to the location from the Sweet Laurel cookbook, as well as new treats, including a keto-friendly brownie! Though it is hard to believe, everything on the Sweet Laurel menu is grain-free, refined sugar-free, and dairy free. You can also expect lots of drool-worthy vegan options available and kid’s offerings too (nut-free fairy cakes and baby-cinos)! As for you caffeine addicts, Sweet Laurel has you more than covered for your morning fix! The Coffee & Tea Program is in partnership with Caffe Luxxe. Beverage selections include Coffee, Tea, and Super Food Lattes, like a Vegan Caramel Latte, made with Sweet Laurel’s homemade vegan caramel, and a Collagen Breakfast Latte, made with organic coconut cream. As for the stunning interior, the vibe is very Parisian café meets Mayfair textures. Think old world meets minimalist California modern - chandeliers and light fixtures by Littman Brands, countertops by Caesarstone, a gorgeous cherry blossom cash wrap by clé tile and furniture, including an eye-catching blush pink velvet banquette seating, by Room & Board. You can also do a touch of shopping after indulging in cake! The Sweet Laurel retail section carries Sweet Laurel’s pantry products for sale, including, Chocolate Cake Mix, Vanilla Extract, Vegan Caramel, a 100% Cacao Bar, and of course their newly released cookbook! 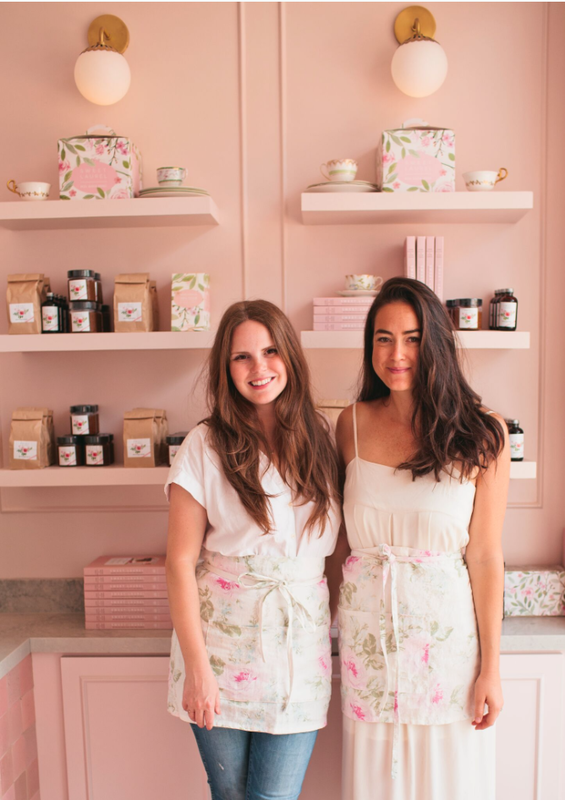 Visit Sweet Laurel’s first brick and mortar shop in the Palisades Village 15279 Sunset Blvd, open 7 am – 10 pm Daily.